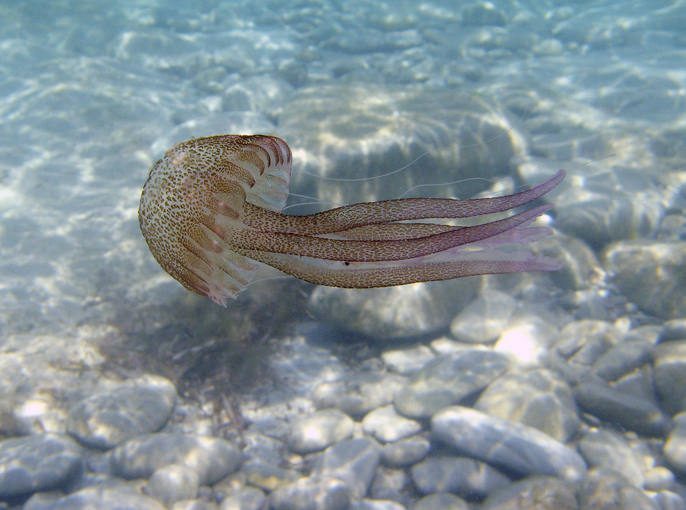 Unfortunately, in recent years on the Mediterranean coast there has been an increase in the multiplication of jellyfish as a result of a variety of human activities, representing a growing threat to recreational activities and water sports. A jellyfish sting can be pretty unpleasant. Last year the Pelagia noctiluca jellyfish (Purple jellyfish) in particular was seen on the Malaga coast. They are very small (a few centimetres), purple-pink and semi-transparent, which makes it very difficult to see them in the water. However, they don´t “attack” swimmers, but are carried by sea currents and are quite easy to avoid, as long as there aren´t too many. Jellyfish are not very interested in stinging us, because when they do, they lose a portion of their tentacles. So stay calm and don´t panic. You have to swim very gently, moving away from it very slowly and trying to avoid it, and nothing will happen. If you swim faster with violent movements, you´ll attract its thin tentacles towards your body and get stung. Almost fifty percent of jellyfish stings are produced by panic. If you get really close, we recommend placing the palm of the hand in the most jellied part, the umbrella, and push it very slowly sidewards. The tentacles will follow this movement and won´t sting you. In urban beaches all along the coast of Malaga there are flags indicating the status of the sea and the presence of jellyfish. In these areas there is also usually a lifeguard if you have been stung by a jellyfish. The frequent application of sunscreen is not only useful against sunlight, but is also quite effective insulating from the tentacles of jellyfish. Do not touch dead jellyfish or fragments of them, as their stinging power lasts up to 24 hours, even out of water. Do not scratch or rub the affected area. Wash the area with seawater. Remove the debris with tweezers. Apply ice to relieve pain. When using ice, it should not come into direct contact with the skin. Many locals (including the author) usually carry in the beach bag a small bottle with vinegar or ammonia as a first aid means. In pharmacies you can also purchase handy applicators (especially useful for children). Or you go to the nearest lifeguard. Protect the affected area for the next few days of direct sunlight. The Classroom of the Sea (Aula del Mar) of Malaga has developed a useful “Jellyfish-watch” app for android you can download at www.infomedusa.es/download. Although so far the app is only available in Spanish, at least it gives a quick update on the current state of the beaches of Malaga.